Our Search Engine Marketing Company specializes in Web Design & Law Firm SEO & Social Media Marketing. 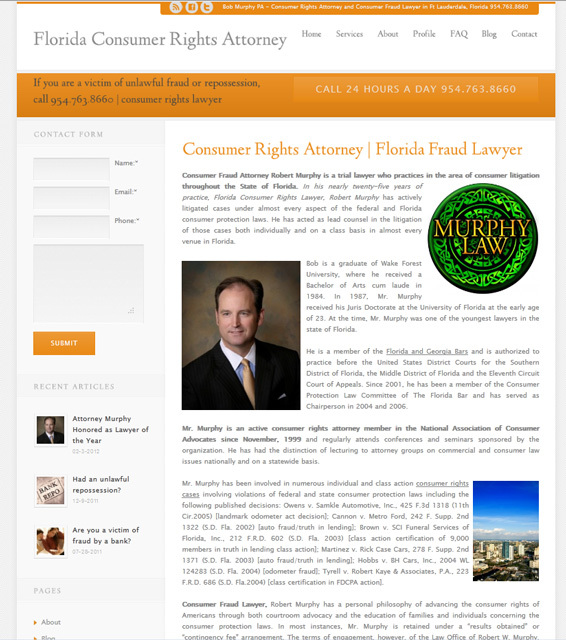 We just built this website for Fort Lauderdale Consumer Fraud Lawyer, Robert Murphy. The old website was extremely outdated and looked like it had been built ten years ago. We taught Mr. Murphy how to update his own blog and make edits to the web site and he will be posting articles and awards about his practice and years of experience representing individuals who were victims of bank fraud, unlawful repossessions and other consumer rights issues in South Florida. We just recently finished the project but are already making some excellent gains in SERP, Search Engine Ranking Positions. Mr. Murphy was referred to us from another satisfied attorney in a different area of practice. He also had a stale site that needed some local web designers in Fort Lauderale to fix it up. We did just that! Click on one of the links above to see his new web 2.0 design. After a few months of service, our seo company Fort Lauderdale proved to be very effective for Mr. Murphy’s rankings. His site can now be found for numerous searches on the first page of Google thanks to our Local Florida Search Engine Optimization Company.